The short version: he has suffered a brain hemorrhage with massive bleeding, possibly caused by blood thinners he was taking after a mild stroke last week. The talk is that, even if he survives, he will not be able to execute the office of Prime Minister (and the other portfolios he holds); the Sharon era is over. I'll add more of my own thoughts to this later; stay tuned. For those looking for a simple answer -- what will this mean for the future of Israel, the prospects of peace in the Middle East, and so forth? Answer: not too much. Yes, Sharon is in many ways a pivotal figure -- under his leadership, Israel's foreign policies have changed direction dramatically, in some ways as much as American foreign policy has changed under President Bush. Yes, there will be some chaos to work out on the Israeli political scene. But heck, there's always political chaos to deal with in Israel; Israeli politics are lively enough to make American politics look dull and tasteless. There has already been a smooth transfer of power, to Deputy Prime Minister Ehud Olmert (former mayor of Jerusalem, among other things), and, barring unlikely drastic moves on his part, things will most likely continue as before. Life will go on; Israel, and Israeli policies, will endure. Remember, the major changes in policy instituted by Sharon -- the unilateral abandonment of the Gaza Strip to the Palestinians, the evacuation of a handful of Jewish settlements in the West Bank -- were completed last summer. The ball is in the Palestinian court now, so far as major moves for peace are concerned. Let me add, by the way, that the reactions of Palestinians to this is none too encouraging. As Omri says, why are they celebrating the near-death of the only political leader anywhere who has ever given the Palestinians land of their very own? No Israeli leader has gone so far in this direction as Sharon did... and no Arab country ever tried. Not Egypt, not Lebanon, not Syria, not even Jordan... no one. Say a prayer for the prime minister. Say a prayer for the man who could not be broken. Say a prayer for our shattered present. Say a prayer for our shuttered common future. Pray for the man who could not be stilled. Pray for the man who could not be swayed. Say a prayer for the future only he knew. Say a prayer for the people he has left behind. The Jewish People, the people he loved, at times despite himself, despite them. The people who could not bring themselves to love him. Pray for those of us who once embraced him, and came to curse him. Pray for those of us who once cursed him, and could not bring ourselves to forgive him. Pray for those who call themselves religious and see in this, the hand of God. Pray for those who call themselves non-religious and need now to pray. Pray for the leaders who, unable to replace him, will now succeed him. Pray for a miracle. Pray for all of us. Pray that we may know to heal each other. Pray for this land. That it may know the peace that he never will. This is a good time to pray -- not for the peace of Jerusalem, but simply for the health of a man, someone who never stopped fighting for his country. He fought as a young man to establish the State of Israel in the first place, in the 1948 War of Independence; he fought as a general in 1956, 1967, and 1973; he fought as Defense Minister in 1982; and he has fought for Israel ever since. He has led the State of Israel with guts and gusto that are virtually unmatched; he will stand shoulder-to-shoulder with Israel's giants. 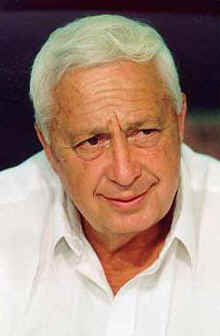 Mi she-beirach avoteinu, Avraham Yitzhak ve-Yaakov, hu yevarech ve-yirpeh et Ariel Sharon, rosh memshelet Medinat Yisrael. Ha-Kadosh Baruch Hu yemaleh rachamim alav, le-hachlimo u-lerafoto u-lehachziko u-lehachyoto, ve-yishlach lo mehera refu'ah shlema min ha-shamayim, lirmach eivarav, u-shesa gidav, betoch sha'ar cholei Yisrael -- refu'at ha-nefesh, u-refu'at ha-guf: ve-nomar, Amen.